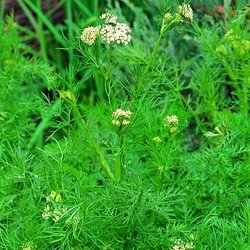 A member of the Parsley family the leaves can be used in the same way and the seeds once dried can be used in cakes&comma; sweet dishes and stews. Can aid digestion and flatulence. The roots can be used the same as a parsnip. Once the the plant has established and its 10cm tall or larger. The seeds and roots will not be ready until the following year.